“Unredeemed Land” details how the Civil War and the emancipation of slaves reconfigured the natural landscape in the South. (Dec. 10 – 2018) – The Civil War and the emancipation of slavery not only led to political, economic and social revolutions, it also fueled drastic changes to the physical landscape of the South. 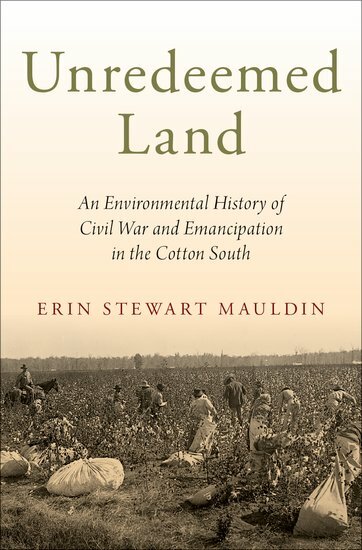 That’s the subject of Dr. Erin Mauldin’s book “Unredeemed Land: An Environmental History of Civil War and Emancipation in the Cotton South.” The book, recently published by Oxford University Press, traces the environmental changes stemming from the rural South’s transition from a pre-Civil War plantation economy to a more intensively capitalistic farming during the late nineteenth century. “The central theme is how the Civil War and the emancipation of slaves and their newfound mobility reconfigured the natural landscape in the South and the farming economy dependent upon it,” said Mauldin, an Assistant Professor of History at USF St. Petersburg. The South’s economy prior to the war, known as “King Cotton” due to its key commodity, required extensive land-use techniques across large swaths of acreage, healthy soil and most importantly slave-based agriculture to remain profitable. Shifting cultivation – farming in different locations around the plantation every two to three years – kept the soil renewed. Most farmers grazed their livestock on common lands, which kept stock raising cheap. And four million unpaid African American slaves toiled the fields for the profit of landowners. As the war came and raged from 1861-1865, mostly across southern lands, the direct impacts to the landscape were evident. Mauldin assumed it was these direct impacts that led to the massive environmental changes that took place in the South after the war. But as she researched further, she uncovered it was what came after the burning and digging that drastically transformed the landscape and overturned the basis of the southern economy. In the place of slavery came a contract system between landowner and former slaves called sharecropping. The farmer would receive a plot of land on the old plantation to farm for themselves, with a percentage of the crop going to the landowner at the end of the year. Large plantations became subdivided into many parcels of land, largely farmed by former slaves and displaced white Southerners. However, each plot was rather small, making it impossible to shift planting around one’s plot of land from year to year. This led to repeatedly farming the same area, draining the soil of nutrients and eventually making it far less productive. Coupled with this, states began closing their open range during Reconstruction. Farmers’ livestock could no longer freely roam and forage in woodlands and old fields, hence maintaining cattle, pigs and other animals became costlier. This limited African-Americans and poor Southerners to growing cotton, even as the soil for doing so was deteriorating. Mauldin concludes that less shifting cultivation and more intensive cotton farming hastened the collapse of the region’s subsistence economy and ultimately kept cotton farmers – many of who were now former slaves – trapped in a cycle of debt and tenancy. The environmental impact from these changing practices didn’t just alter the agriculture and economic trajectory of the South; it also led to the migration of African Americans from rural to urban areas. Many cited poor land and the inability to make a profit from cotton as their reason for leaving, stated Mauldin. What happened to these black farmers and their families in these emerging cities will be the subject of Mauldin’s next book.